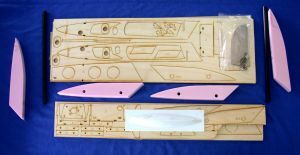 "Rigged Insanity" boat kit by Osborn Model Boats. Want to get into "Fast Electric" boat racing? 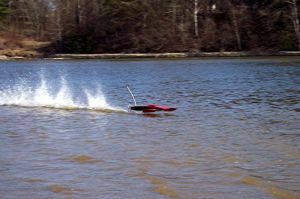 Or just want to "fly" around your local pond at "insane speeds"? This is the kit for you!! This laser boat kit comes with all the essential parts to build yourself a high quality racing "rigger" hull. Quality laser cut parts and detailed instructions with full illustrations, make this a easy build for the first time builder. This is a great boat for a 2s Lipo system or a 4s stock class motor system like the AquaCraft 2030 system. Kit requires full assembly and painting! 2 Channel radio system with one servo. Batteries (specifications to be determined by motor choice). Some recommended motors and battery power. Only use High quality Lipo cells of 4500mah or greater and 35c or greater.